We introduced the Group Types API in #6784. This ticket is to flesh out the API for frontend integration. Group type directory - I've set a marker (buddypress()->groups->current_directory_type) in groups_directory_groups_setup() to determine if we're on a valid group directory type. This differs from the marker set for member type directories, which is set in our URI parser (bp_core_set_uri_globals()). bp_groups_set_group_type() - $group_type parameter now accepts an array, so you can pass multiple group types for saving instead of just one group type. Admin metabox currently uses a <select> dropdown box, but if a group has multiple types, a super admin cannot select more than one type. Probably refactor this to use a multiple <select> dropdown box. 7210.01.patch​ (18.9 KB) - added by r-a-y 3 years ago. 7210.02.patch​ (22.9 KB) - added by r-a-y 3 years ago. 7210.admin.patch​ (6.1 KB) - added by r-a-y 3 years ago. 7210.checked_by_default.patch​ (2.8 KB) - added by r-a-y 3 years ago. 7210-directory-type-message-markup.patch​ (760 bytes) - added by hnla 3 years ago. // New for 2.7 - Change 'teams' to whatever slug you want your group type directory to have. 'show_in_create_screen' - if set to true, the group type can be selected on the frontend group creation screen and in the group's "Manage > Settings" page. Default: false. 'show_in_list' - if set to true, the group type will appear in the group type list as rendered by bp_group_type_list() (​Screenshot ). This defaults to true if 'show_in_create_screen' is set to true. Default: null. Groups: In bp_groups_set_group_type(), allow an array of group types to be set. Groups: In bp_groups_register_group_type(), introduce new arguments for frontend integration. article will be updated to outline these parameters. Groups: Add group type settings fields and a group type list on single group pages. If group types are registered with the 'show_in_create_screen' parameter, group administrators can set the group type when creating a group or when on a group's "Manage > Settings" page. If group types are registered with the 'show_in_list' parameter, a comma-delimited list of group types can be displayed for a group with the bp_group_type_list() function. By default, this function is used on a group page's header. Groups: Add current group type to group directory template hierarchy. Correct misuse of escaping functions, part 2.
dcavins and I are eating the same pizza. See r11141. @hnla made a good point in Slack today about adding in a new parameter so a group type can be automatically checked during the group creation process. This is just a note for me to return to this on the weekend. Allowing for a value to be set to represent a default checked=checked on register is a good idea, let the dev or admin decide which 'type' represents a 'normal' or 'default' group for their install. Of a lesser note are we concerned that in an existing install of groups if one then sets a new group 'type' then creates or associates a group to that type we now have a group list with a column that shows a group type string(label) for perhaps one group but the rest of the type columns for groups are empty, likewise create steps shows one group type, the possibility of creating a non group type exists but isn't clear? BP sets a type 'normal' for all groups unless create steps or admin backend has overridden with a new or specific type from the choices (yes this step is problematic as it means running through all groups adding values to the type field so perhaps not a great idea). A new param is provided to allow for a preset checked=checked to exist for a chosen type. If this param wasn't set and if BP did set a type 'Normal' the default selection would be this value 'normal' set by BP automagically. That last option is really not massively important but could be nice but how that is generated to screen needs thought so that appropriate markup would be generated so likely a step too much at this stage. It feels as though the group type selection should be on the initial screen along with the name and descrip and thus part of that initial group save, currently I'm needing try and remove plugin creation steps that might be easier if definitively I could check for group type from the very first stage or at the earliest possible moment in the steps. 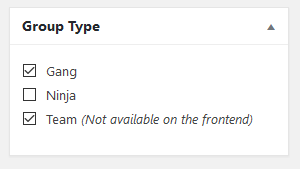 "Not available on the frontend" is a label that is shown when a group type is registered with 'show_in_create_screen' => false. At the moment, the patch doesn't cover the "Change group type to" bulk actions select box that @dcavins put together. Could use some feedback from him on how to proceed. I'm going to put together another patch to handle the default checked types that @hnla and I are discussing since comment:19. We can improve this in the next release (similar changes would need to be made to the users list table bulk change tool, too). WP itself has a similar inconsistency between the user list table "Change role" select and the use of checkboxes to set multiple roles on the single user manage screen. This ticket was mentioned in ​Slack in #buddypress by hnla. ​View the logs. Groups Admin: Better support for multiple group types. When editing a group, you can now set multiple group types for that group. When viewing the Groups admin dashboard, all group types for a group are displayed in the "Group Type" column. bp-legacy: Do not show trailing dash for empty group type description. @hnla - I've added checked_by_default.patch regarding comment:20. The new parameter is called 'create_screen_checked_by_default' and defaults to false if not set. The new parameter name sounds a little wordy to me. Any suggestions for a better name? Let me know what you think and whether or not this solves your problem. @dcavins - I agree about moving the bulk change action stuff to the next release. Perhaps we can make this a 4.7-only feature? Think it's going to be wordy regardless and I don't see a problem with your choice as for alternative suggestions? Could ring the changes ad nausea, think it's just a necessarily wordy key. you can now set multiple group types for that group. It tests fine, as to solving problem I think it is a smart option to be able to have set in advance and certainly prevents accidental type selection, so all round a 'good thing'. The concerns with pre-existing groups not having a 'type' and columns in admin remaining blank are maybe unfounded, it feels wrong but then nothing will break as a result, there may be use cases where it's best that all groups do have a type though but I can't see that for sure at this moment. and we would have to run some form of update over all groups setting to a 'default'. My pressing concern is that I do think the creation step initial screen must house the Name, Descrip, and type as the three fundamental pieces of info before we create a group_id then checks on the other steps can be made to bail out of custom group steps more easily or adjust subsequent step screens. Of course conversely we simply wrap in span with or without a class and leave to pure styling with no explicit semantics. @r-a-y same goes for bp_group_type_list The <strong> element might be better served and the cdata as something like a dl list as we're possibly running a few items in a list. @hnla - Thanks for the feedback. I would consider the group privacy option more pressing than the group type. Group privacy is also listed on the second step as well. Would welcome other feedback here, but I think we need another cycle to re-evaluate all the other group options during the group creation phase. So if we change this here, we'd need to change it for member types as well. bp_group_type_list The <strong> element might be better served and the cdata as something like a dl list as we're possibly running a few items in a list. Although the use of this markup can make lists more readable, not all lists need markup. For instance, sentences that contain comma-separated lists may not need list markup. I think the last block applies to us here. Actually not ok :) I don't really care what legacy templates do any longer they are dead to me however I do want and expect to be able to make a choice on the newer templates and despite the W3C( who haven't always got things spot on ) ) I probably would favour listing but more to the point to get what I may judge to be right I don't want to be doing silly hoop jumping exercises like having to filter functions just to change something so trivial. Part of what I wanted to progress albeit slowly was this idea of decoupling core from markup so either a function accepts params to set what markup used or core simply passes over the data and the templates generate the markup; I have to see what works best for the nuoveau templates in this and probably like minded template tags in core so not suggesting anything for the moment but will try and patch a solution for 2.8. Are you referring to the group type directory message or the group type list function? I don't mind if we make the change to the directory type message, although the change is quite trivial. strong is a logical state, and bold is a physical state. to render it red, or a different size, or underlined, or whatever. It makes more sense to change the presentational properties of strong than it does bold. and making bold do anything other than bold text would be confusing and illogical. <strong> sounds like the correct use here, but I could be wrong. On the other hand, bp_group_type_list() is new, so we can make whatever changes that we need to. Right now, the function was created to output a comma-delimited list (I guess the function name isn't named appropriately :) ). List items are not really appropriate for comma-delimited lists unless you want to use CSS :before and :after declarations, which complicates things. I guess it all depends on what you want to do with the function. If you plan on using this function for list items, then the function needs to be tweaked to accommodate it. I think the parameter name is OK as create_screen_checked_by_default. You could shorten it to create_screen_checked and the meaning would still be pretty clear. Re bulk changes, I'm hoping to add a multiple edit interface to the groups list like WP uses on the posts list, where you choose several items then click edit and get the quick attribute editor. Would be good for types, status, etc. Could also be used to add members to multiple groups. Groups: Add 'create_screen_checked' argument to bp_groups_register_group_type(). ultimately lies with the group creator. No matter @r-a-y I'll work out what we need by way of ease of access to these elements so we can change as see fit, I'll try and make a note on Nouveau tickets about it. Semantics and markup discussions finished please do what you think best I'm just confusing the issue get things in and we'll worry about this sort of detail another time. I think all the main tidbits are in. Going to close this one! Groups: Fix various notices during implementation of group types.